Many people don’t realize how important getting a good nights sleep is. And it’s not just about the amount of sleep, but the quality of sleep as well. From aches to pains, indigestion, or even a tendency to snore, there are positions in which you can sleep that can help cure what ails you. 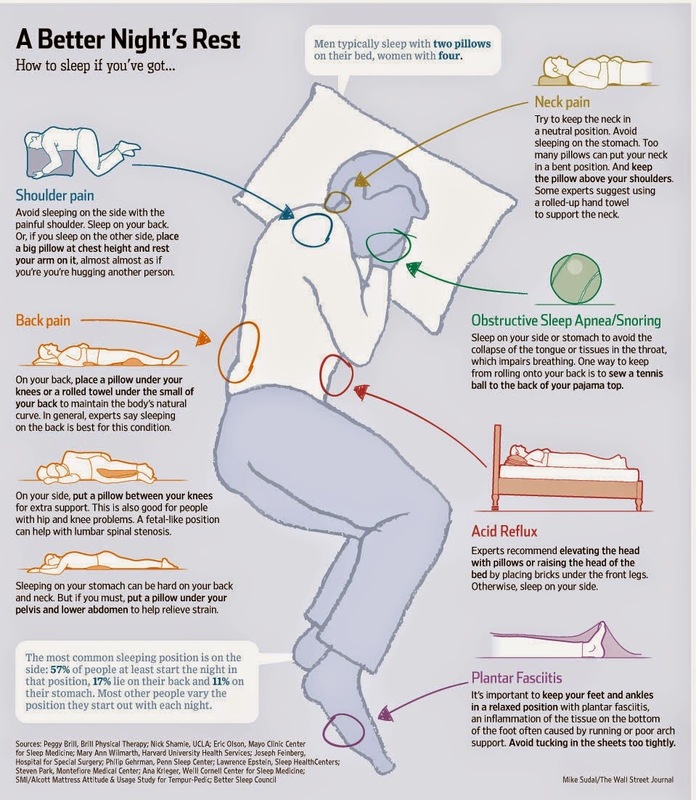 Below is an awesome info-graphic from The Wall Street Journal that points out some of the most common troublesome positions and highlights how you can adjust these so you can go back to having undisturbed, restful sleep. Are you suffering from back pain? You could try sleeping with a pillow between your knees. Do you have indigestion or acid reflux? Try elevating your head a little with some of your fluffy pillows or with your bed by placing some bricks under the legs. Wasting your precious sleeping hours by forcing yourself to sleep uncomfortably is exactly that, a waste of your health and time. If you want more information other than this info-graphic on how sleeping positions can affect you, we’ve included a link to the full WSJ article as well as a research link at the bottom of this post.